Susan Schenck was a raw vegan for almost six years and was so enthusiastic about the diet that she wrote a book about it called “The Live Food Factor” that has been referred to as the “bible of the raw food diet”. But after eating this way for several years she began to notice a decline in her health with blood tests showing a variety of imbalances. In her book, Beyond Broccoli, she explains how raw and vegan diets can lead to nutritional deficiencies and provides readers with practical advice on how to regain their health. The book documents her personal experiences as a raw vegan, as well as that of many other individuals, and also includes references to numerous scientific studies. Susan Schenk starts by bringing attention to the fact that very few people are talking or writing about the potential deficiencies that can occur on a vegan diet, with the exception of vitamin B12. She says her primary motive in writing this book is to educate people about these issues and the possible dangers of vegan and vegetarian diets. She then outlines her personal experiences with raw and vegan diets and explains how her health deteriorated after a few years of eating this way. Her memory was declining, she was losing muscle that was being replaced by flab, she was getting bags under her eyes and she was having trouble managing her weight. As soon as she started consuming wild fish, organic chicken and grass-fed meat on a regular basis, all of her health problems were quickly resolved. She came to the conclusion that she has a biological need for meat in her diet, especially small oily fish, in order to maintain optimal health. Schenk explains that vegan diets have only recently gained popularity and we don’t really know the long-term effects of this way of eating, particularly how the next generation may be affected. She brings attention to the fact that many of us may be biochemically dependant on some of the nutritional components that are only found in animal products, such as long chain omega-3 fats and fat-soluble vitamins. A number of subjects are discussed in the book including our evolutionary dietary history, metabolic types, benefits of a reduced carbohydrate diet, safety of eating raw meat and fish and the spiritual aspects of eating meat. Schenk also offers tips for committed ethical vegans and vegetarians on how to address potential deficiencies through the use of superfoods and nutritional supplements. Raw vegetables, berries, apples, grapefruit, mangoes, sardines, mackeral, wild salmon, organic eggs, raw goat milk, buffalo, grass-fed beef, avocado, coconut, olives, yacon, stevia. Here is an example of Schenck’s diet although she doesn’t necessarily recommend this for everyone and her book does not include a meal plan. This book only explores vegan diet deficiencies and does not include exercise recommendations. 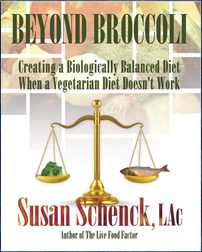 Beyond Broccoli: Creating a Biologically Balanced Diet When a Vegetarian Diet Doesn’t Work retails at $19.77. Author has personal experience with raw and vegan diets. Offers opinions that are supported by scientific research. Outlines the potential deficiencies of vegan and vegetarian diets. Provides options for those who wish to remain vegan to avoid nutritional deficiencies. Will not appeal to people who are vegan or vegetarian for ethical reasons. Is not an actual diet program. Raw eggs, meat and fish may pose an increased risk of food poisoning. Beyond Broccoli highlights the potential problems with vegan and vegetarian diets, including the nutritional deficiencies that may arise when these diets are followed for an extensive period. The author, a former raw vegan, advocates the inclusion of 5 to 10 percent of calories of high quality animal products, such as organic eggs, wild fish and grass-fed meat, in conjunction with a diet containing a high intake of raw plant foods.